Tiger Tiger takes us through the triumphs and pitfalls of Seasonal Acts. With so many shows themed to seasonal festivities in the burlesque world (Christmas/New Year, Valentines, Easter, Halloween, etc) it is almost automatic to pop a seasonal routine or two into your repertoire, possibly even a bespoke act that can be altered to fit one or more festivities. As a fellow performer, audience member of more amazing, spectacular, fairly good and mediocre shows than I can remember, and a show promoter, here are a few suggested dos and don’ts for your seasonal routines. When you work in a world of themed shows, it’s always a bonus to have a go to seasonal act. It can be a specific routine, or a routine that has a seasonal version – such as Violet Vayne’s seasonal mambo Christmas version of Honey I’m Home. This could mean changing the music and/or some of the props, the choreography, and can involve a lot of hard work and rehearsals to keep it separate in your head from the alternative of the routine, only attempt this if you have the time, energy and passion. Don’t – be too slap dash with it! A generic routine in your repertoire that can be adapted to any season is a good idea, but don’t make it so that it can be adapted to ten different things. Chances are, if it can be altered to fit so many different themes, it can end up being a weak routine with no grounding. Do – tell a story!! Not every routine has to tell a story, however in the world of seasonal burlesque it’s a lot easier to stand out if you have a strong theme or story to your routine. As a promoter, I look for unique and entertaining acts, I won’t be choosing performers doing a straight strip to Santa Baby (believe me, there are a lot of them!) or any of Christmas song – a Christmas song does not make it a Christmas routine. I will be choosing something that stands out, like Tuesday Laveau’s Christmas in New Orleans or Beatrix Von Bourbon’s Winter. The same goes for all seasons, bunny ears do not make an Easter routine and using a goth/rock/metal song, does not make a Halloween routine, whether you pop on some Zombie make up or not. A promoter will be looking for the acts that stand out, like Lou Leigh Blue’s Mummy act or Penny Bizarre’s Sister Samedi. Don’t – be afraid to make a season your niche! There are some performers out there who have made a repertoire of acts that (purposely or not) almost entirely suit one particular seasonal festivity, and yet they still get work the rest of the year too. If your style is the sweet and lovely that goes down well at Valentine’s you won’t be out of place at other times of the year. And ask Lilly Laudanum about how she fares the rest of the year with her own unique brand of gorelesque, historical and bawdy burlesque that makes her a Halloween favourite – chances are, fairly well! If you don’t feel it, don’t do it – nothing is more “meh” to watch than a forced and phoned in routine. If you don’t connect with it, don’t put it on the stage. You don’t have to have a seasonal routine, there will be other shows, and not all shows at festive times of year are totally themed. Many newcomers fall into the trap of applying for shows with the words “I don’t have anything yet, but I could put together a suitable routine.” 9 out of 10 promoters will not hire you on these words – they want a well thought out routine that you already have in your repertoire. If you don’t have a suitable routine, maybe this isn’t the show for you. 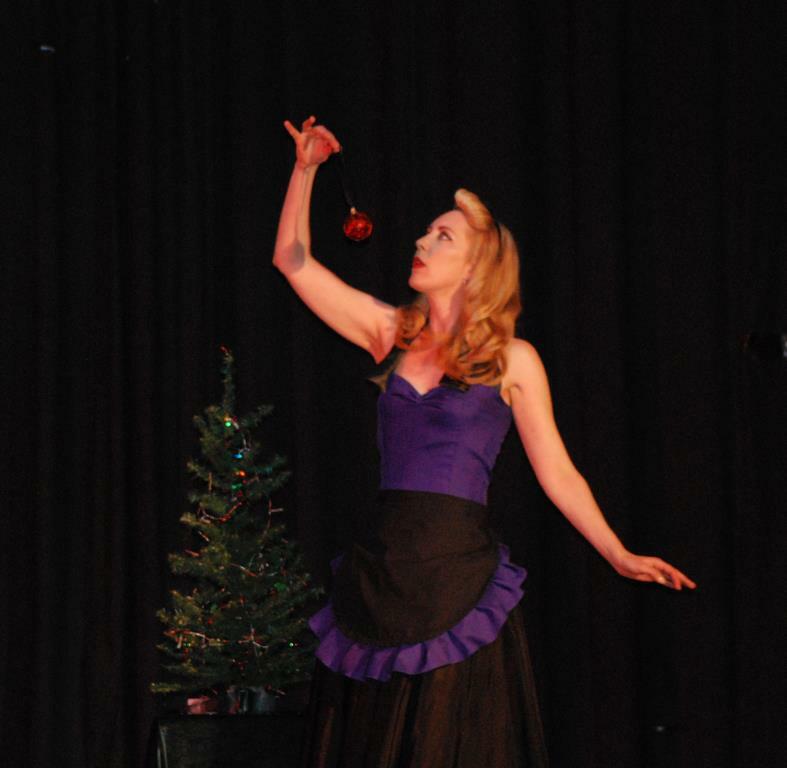 Alternatively, if you’re desperate for that stage, then suggest an alternative – I perform my Too Hot To Hula routine just as much at Christmas shows as I do in the summer, usually billed as an anti-winter routine to bring sun shine to the show. Otherwise yeah, don’t worry, there will be other shows. Do – rehearse, rehearse, rehearse!!! This is so important I cannot stress it enough! So you have your seasonal routine, and you’ve just done a whole weekend of Halloween shows. Awesome!! Now you’re going to pack up the costume and let it gather dust for a year before it sees the light of day again. Just make sure when you pull it back out of the box that you give it the rehearsal time it deserves! So many performers have other commitments (other work, children, hobbies, etc) that it can be hard enough to find the time to rehearse the routines you do on a regular basis. Be sure to prioritise those seasonal ones and give them more than the time they deserve, because a year between shows with no rehearsals can really tell when you bring it back to the stage. Do – have a bloody good time!! Enjoy those seasonal shows! Believe me they are often the best – the atmosphere and audience are usually even more buzzed than usual, the exhilaration of doing back to back shows a couple of weekends in a row, the fun party spirit. But as with anything in burlesque my advice will always be – feel the joy on stage, if you don’t feel the joy when you are performing, don’t be doing it! So, whether Halloween or Christmas or any of the festivities thereafter, bring your A Game and be awesome! See you all on the stage! This entry was posted on October 5, 2012 by coochiecrunch in Coochie Crunch Blog and tagged Beatrix Von Bourbon, Halloween, Lilly Laudanum, Lou Leigh Blue, Penny Bizarre, Tiger Tiger, Tuesday Laveau, Violet Vayne.